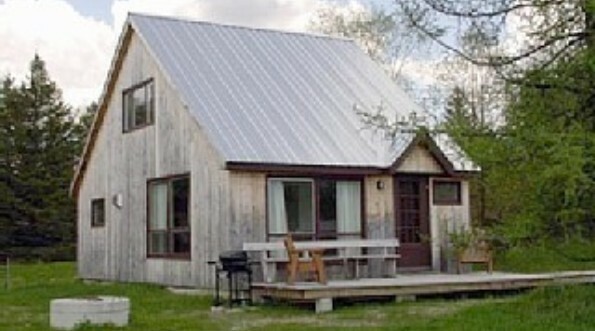 Our Vermont Vacation Cottage located near East Craftsbury, VT is located in a rural setting with views of the mountains, the trees in the distance. The locals may call it a cabin or camp. The area is mowed around the cottage so there is lots of open space. Inside there is an open living, dining, kitchen area with pine wood floors and a vaulted ceiling. The bedroom and bathroom are also located on the first floor. You enter into a tiled entrance way with stairs leading to the second floor loft area where there is additonal sleeping beds, the TV,VCR,DVD. There is WiFi in the cottage. There are picture windows on the first and second floors looking out onto the mountains, open fields, and trees. The living room is sure to be a favorite room in the house, with vaulted ceilings, picture windows looking out onto the fields and mountains. There is a Vermont Casting Propane stove that provides most of the heat for the cottage. The living dining area has a futon for additonal sleeping and also serves as a comfortable couch. There are additional chairs plus the table and chairs for dining. You will enjoy our collection of "outsider art" throughout the cottage. The kitchen which is part of the first floor living area, is fully equiped with a propane gas 4 burner stove and oven. There is a full sized refrigerator with freezer, an electric coffee pot, a microwave, a toaster oven. There are Knives, forks, etc and cooking pots, pans, openers and a dinner service. Also in the kitchen area is a radio with, VCR and MP-3 connection. Also there is basic condiments such as salt, pepper, coffee filters, etc. There is just about everthing that you will need. The dining area is part of the first floor open area and has a round table with four chairs around the table. There is a leaf that can be added to enlarge the table. There are other chairs in the open area that can be used for additional seating. The Master Bedroom on the first floor has a standard sized double bed. The room is on the first floor and has a large closet. There is a side table with a lamp and a clock radio. Also a nice window that opens with a view of the mountains. On the second floor loft area there is a futon for additional sleeping. It can be used as a double bed or two twins. Also in the loft area is the TV, VCR, DVD player. The TV is a satalite connection. There are stuffed chairs for sitting as well as the futon, with an oriental rug. There is a picture window facing the mountains and additionl windows on the opposite side looking into the yard. There is a phone on the second as well as the first floor. The stacking washer/dryer is located in the bathroom. There is a full sized bath and shower. Also a wash stand and toilet. There is a window that looks out onto the yard. There is a deck on the front with two chairs and a large bench for great viewing of the fields and mountains. There is a gas grill on the porch. All around the house is mowed grass, so there is lots of room for games and for the kids to safely play. There is also a fire pit. Lots of room to park. If you come in the winter with your snow mobile you can park on site and get to the Vats trail at the head of the driveway. The driveway is about 100 yards from the main road to the cottage.